Read from July 14 to August 06, 2015. I wanted to like this book, I really did. 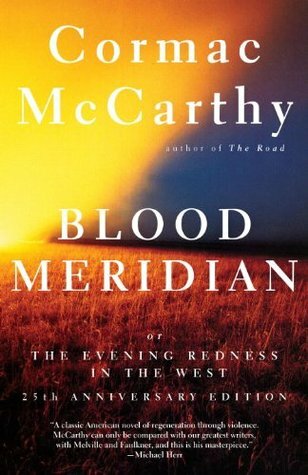 I was excited to read this book as I had never read anything by McCarthy prior to this. I had heard so many great things about him so I’m a bit disappointed I didn’t enjoy this book more. I haven’t given up on McCarthy yet though! I will read The Road, his most notorious publication before I make my final opinion on him. The book takes place around the Texan and Mexican border in the US during the 1850’s. The book follows a runaway teenage boy, known only as, the kid and after getting arrested in Mexico he is acquainted with some men and works his way into joining their gang in order to get out of prison. The gang is a depiction of the historically notorious Glanton gang, who hunt for the scalps of Native American’s for profit and pleasure. After terrorizing and taking scalps the gang comes up with an idea to rob a bank, which ultimately doesn’t go well. Wounded and taking heavy losses, the remaining gang works their way through the desert where tensions within the group begin to show themselves. I did appreciate McCarthy’s style, or lack there of in a way. McCarthy is one of the few authors that can get away without using practically any punctuation. This lack of punctuation worked really with the characters and their Texan slang but as a reader, you’re left to determine who is speaking because McCarthy never uses quotation marks. I definitely had to re-read a few pages just to follow some conversations. McCarthy also uses a substantial amount of Spanish, which he did not translate. So if you’re not familiar with Spanish, you’ll most likely have to do some translations yourself to understand what’s going on. Also, I don’t think I’ve ever looked up so many words in the dictionary before. McCarthy is a well-versed man. I felt the most interesting parts of the book were all about the kid’s rough childhood. After he joined up with the group of men to start scalping native heads, is where I started to lose interest. Not because the book lacked for violence or because the characters were uninteresting but because I couldn’t keep track of the plot. The scenes all seemed to resemble each other in that the group of men would scalp some heads, get in trouble with the natives or the locals, then meet some new people during their journey’s through the desert and as a result a lot of people died. I know that I was guilty of skimming a few pages out of frustration with this strange plot. I wish that this novel was more focused on the inner workings of the kid rather than the intricacies of the plot and its philosophies. This approach would make the book more pleasurable to read but it would also take away some of its ingenuity. I would recommend this book to those who are familiar with the history of the US at this time and for those who are familiar with McCarthy’s work. Read from March 22 to April 13, 2014. This book has been nominated and has won a variety of awards, to name a few: Man Booker Prize Nominee for Shortlist (2011), Orange Prize Nominee for Fiction Shortlist (2012), Scotiabank Giller Prize (2011). It was also apart of CBC’s 2014 Canada Reads debate, which is what brought me to read this book. I can see why this book won awards. The author is Canadian, the novel discusses the dangers of being black during the Nazi’s reign as well mingling in the ever popular topic of jazz. These are three areas/topics that many critics appear to check off their list as a part of a good novel. The dynamics of the characters and content sounds like they should make for a very interesting plot, and while at times it did, I felt very disappointed with this award winner. Sidney “Sid” Griffiths is the main voice in this novel. He is the bassist in the German/African-American jazz band, The Hot-Time Swingers. Other important members include Charles “Chip” Jones on drums and the ever young and talented Hiero (Hieronymus) Falk on horn. Paul, Fritz and Ernst are the other minor and additional characters in the band. The plot surrounds the bands survival amidst the Nazis. Sid was born in America and can often pass for being white, while Hiero is a “Mischling” a half-breed; he was born in Germany with a mix of German and African blood. His skin tone is quite dark as a result, making it substantially more difficult for him to get around during the Nazi invasion. One of the pinnacles of the story is that the famous Louis Armstrong has extreme interests in the talent of Hiero and he wants to record an album. The story the reader is involved in the most however, is the ever changing relationship that Sid and Hiero have and the eventual regret and mistake that Sid makes with Hiero in which he will come to regret his entire life. The chapters in the story are separated by different time-frames. For example, the story opens up in Paris in 1939 when the band is attempting to record the album. The next chapter is in Berlin in 1992 and here we see a very old and miserable Sid Griffiths. The book does this flip flop, unsuccessfully in my opinion, of time-frames to give the reader an idea of how much time has passed and how long Sid has been living with his one major regret. I found that the chapters were choppy and didn’t flow as nicely as they could have. I found myself at times going back to read an detail that was vaguely mentioned in the past but ends up becoming more important in the future. I also felt that this book could have been more concisely written. The story and concept is good but it was carried out inefficiently. For example, there is a flashback scene with Sid and Chip as teenagers involving some prostitutes, which I believe is meant to show how long the two of them had been playing together. While it’s one of my favourite scenes, I feel it does little to build either of the characters or their relationship at this point in the story. We’re already aware of Sid and Chip’s past at this point, so while the scene was entertaining it had little to do with the main conflicts or developments. While Sid and Chip are dynamic and interesting characters they’re not the most likable. Sid is negative and serious and Chip is a bit sleazy. Hiero is the most innocent and likable character but you actually learn very little about him throughout the book. I feel that this was probably intentional but I feel if we had known more about Hiero it would made the turning point in the book by far more poignant. Overall, this book is very dynamic and it has reached out to a lot of readers with its content and awards. I’m glad I read the book as I like to support Canadian authors but I don’t foresee myself reading anything else by the author.